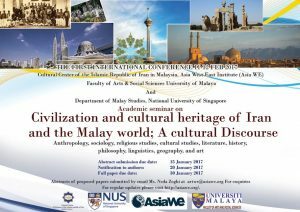 Asiawe- Asia West East Institute, Cultural Center of the Islamic Republic of Iran in Malaysia, University of Malaya and National University of Singapore will hold The First Conference in Civilizational and cultural heritage of Iran and the Malay world 11-12 FEB 2017 . THE first International SEARCH Conference offers an occasion for experts, academics and researchers alike to come together to consider pressing issues in an open forum; seeking to define questions, pursue answers, search for research synergies and more; to both reflect on the recent past, and look forward to the future; to exchange ideas and findings in a congenial atmosphere. Although some research had been done on Iranian influence in the Malay world, there was no consolidated work touching on all the aspects in their complexity. The role of Iranians in the spread of Islam in the Malay world of Southeast Asia is also of interest and spark interesting debates. Due to the academic and cultural significance of this theme, a seminar on “Civilizational and Cultural Relations between Iran and the Malay world”, with focus on Malaysia, is being organised. 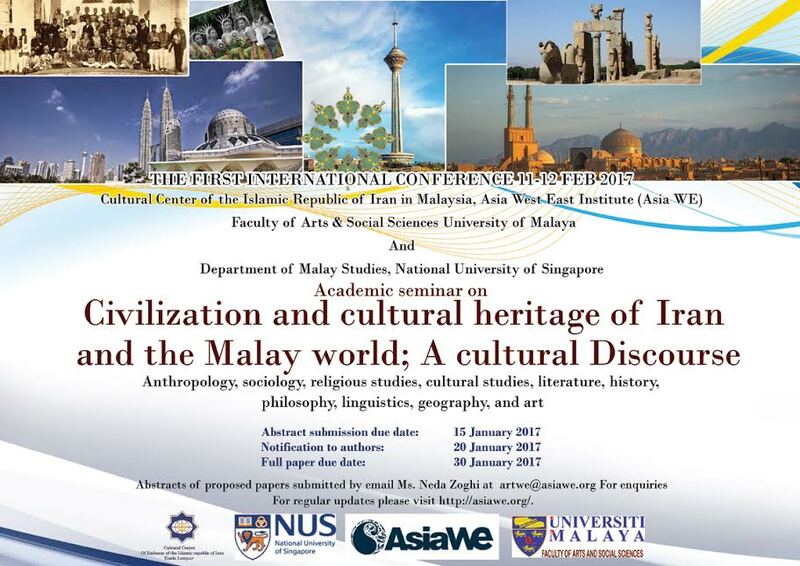 • Historical and cultural relations between Iranians and Malaysians as well as Southeast Asians in a whole. • Current cultural relation between Iran and the Southeast Asia, its perspective and possibilities for future development. • Interaction between Iranian and Southeast Asian thinkers on the social and philosophical thoughts. • Commonalities and differences between the Iranian and Southeast Asian Sufism trends. We welcome contributions related to the above themes from any discipline, including but not limited to anthropology, sociology, religious studies, cultural studies, literature, history, philosophy, linguistics, geography, and art. Abstracts of proposed papers in the range of 200-300 words should be submitted by email to artwe@asiawe.org – by 15 January 2017. The proposals should include the title, name, affiliation, email address and a short biographical note of about 60-80 words in length. Notifications of acceptance will be sent by 20 January 2017. After the conference, selected papers will be published after a rigorous peer-review process. Copyright © 2016 Asia West East Institute. All rights reserved.